UPDATE (June 22, 2018): PAHO announced that genetic sequencing on samples from the acute flaccid paralysis (AFP) patient in Venezuela did not identify the presence of wild or vaccine-derived poliovirus. Type 3 poliovirus was originally isolated from the patient's stool samples; however, this is not unexpected in individuals with prior inoculation. The final determination regarding the cause of the patient's AFP will be made after further clinical and virological assessment 60 days after the onset of the paralysis. On June 7, the Pan-American Health Organization (PAHO) received an unofficial report of a 2-year-old child suffering from acute flaccid paralysis (AFP) due to suspected infection with vaccine-derived poliovirus. The child has no known history of polio vaccination. The initial symptoms presented on April 29, and a national reference laboratory in Venezuela isolated the poliovirus strain from a clinical specimen. Confirmation by a regional reference laboratory is pending. Notably, the child is from a geographically isolated and under-immunized community of Warao indigenous people in the Delta Amacuro state. The PAHO report indicates that a second child with AFP in the same community was also identified—an 8-year-old girl with history of at least one dose of the oral polio vaccine (OPV)—but poliovirus infection has not yet been confirmed by laboratory diagnostics for this patient. In this week’s Outbreak Thursday, we will discuss the significance of this case in the context of the polio eradication effort as well as the circumstances that enabled the re-emergence of polio in the Western Hemisphere. If confirmed as a case of circulating vaccine-derived poliovirus (cVDPV), this will mark the first time polio has been reported in Venezuela in nearly thirty years. 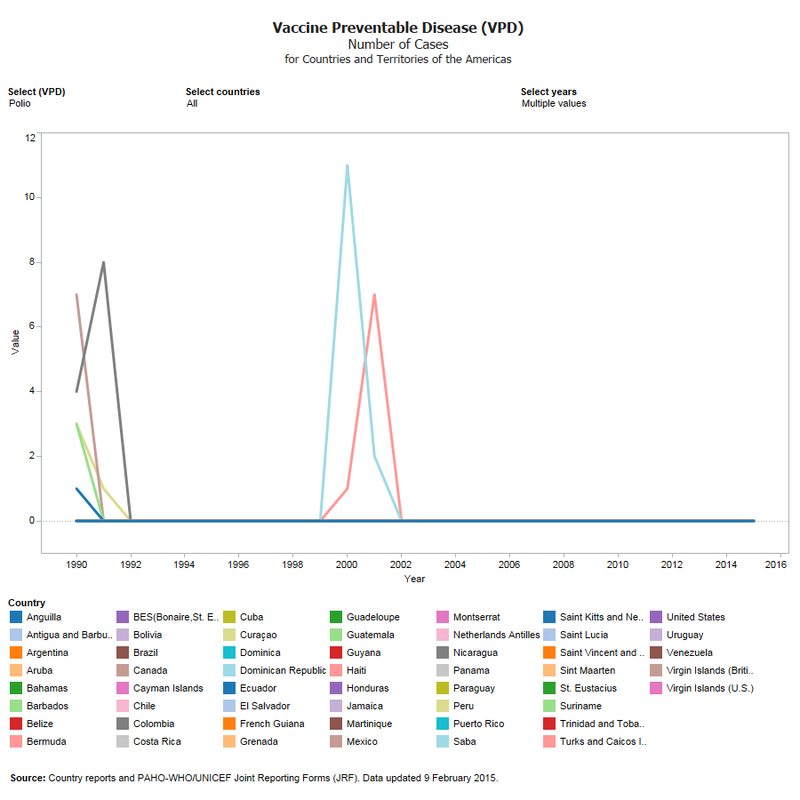 Polio was declared to be eliminated in the Americas in 1994, and the only subsequent reported cases in the region were an outbreak of vaccine-derived polio in the Dominican Republic and Haiti in 2000-01 (Figure 1). The introduction of OPV in the 1970s has been credited as one of the most crucial factors in the elimination of polio in the Americas. One of the benefits of OPV is that vaccinated individuals shed the live, attenuated vaccine strain of the virus, which can then inoculate those who have not been vaccinated directly. However, in under-immunized communities, the vaccine strain of the virus can continue to spread, and over the course of multiple generations (typically over months or years), the virus can mutate into a neurovirulent strain and cause poliomyelitis. One example in the Western Hemisphere was the 2000-01 outbreak of cVDPV in the Dominican Republic and Haiti, which infected 21 and killed 2 before it was brought under control. Outbreak Thursday also covered similar outbreaks in Syria and the Democratic Republic of the Congo in 2017. Each of these outbreaks highlight the importance of maintaining high polio vaccination coverage, a public health capacity that is often lacking in areas of poor healthcare infrastructure and social and political instability. The re-emergence of polio in the Americas potentially signals a significant setback for the global eradication effort. Prior to its current political and economic challenges, Venezuela was recognized as having a comprehensive national immunization plan. However, an economic crisis has produced an enormous range of health consequences, including an 85% shortage of medicine and a riot-inciting food deficit. The combination of poorly stocked medical facilities, hunger, and economic instability increase the vulnerability of affected populations to a myriad of health threats, and Venezuela is currently facing a number of them, such as a diphtheria outbreak that began in 2016, a sizeable measles outbreak (more than 2,100 confirmed cases), and a resurgence of tuberculosis that included a 40% increase in the capital city of Caracas. Additionally, medical staff have been fleeing the country, leaving health facilities understaffed. These factors combine to create weak health systems, which according to the WHO, “struggle to vaccinate every child to ensure high enough protection within a community.” In particular, Venezuela faces low vaccination coverage for polio, with annual estimates typically falling in the 70-85% range. As discussed above, vaccine-derived polio typically emerges in under-vaccinated populations, where the vaccine strain can circulate long enough to mutate. The Warao community, in which the index case of polio was identified, has historically shown a reluctance toward vaccination efforts and has suffered poor health outcomes due in part to its geographic isolation. While the re-emergence of polio in the Americas is concerning in and of itself, the fact that it is taking place in a country with a struggling and fragile health system—and in a state with particularly low vaccination coverage—poses additional risk. The 2000-01 polio outbreak in the Dominican Republic/Haiti was met with a swift public health response and followed up with a targeted vaccination campaign, but if a similar response is not mounted in Venezuela, it could potentially allow polio to gain a foothold in this region. And considering that Venezuela’s current crisis extends nationwide, the risk is not limited to the Warao people, the Delta Amacuro state, or even the country of Venezuela. As previously noted by Outbreak Thursday, the measles outbreaks in multiple countries in South America have been linked to cases originating in Venezuela. There is concern that the “thousands of Venezuelans a day fleeing the country’s political and economic crisis” could result in the spread of communicable diseases, including polio, throughout South America. While measles is far more infectious than polio, it still serves as an example of the potential for communicable disease spread. If efforts to strengthen Venezuela’s health system and implement comprehensive vaccination campaigns are not successful and cannot mitigate what could be a brewing polio outbreak, decades of progress toward polio eradication could be at risk.